As the lead scientist, Dr. Hussain is responsible for the development, direction, and performance of state-of-the-art research in emerging areas of nanobiotechnology, nanotoxicity, and nanomaterial synthesis and characterization. Current research efforts are focused on elucidating the biological response and application potential of engineered nanomaterials (ENM), in the range of 1-100 nm, with novel physical and chemical properties. These physico-chemical properties emanate from interfacial features at the nano-scale and result in distinct electrical, mechanical, optical, and magnetic characteristics that are unique from their bulk counterparts. Fundamental studies currently underway involve nanomaterial interactions with living systems including in vitro and in vivo studies, intracellular fate; uptake, translocation, distribution, and potential toxicity of NMs. This research will facilitate a better understanding of the nano-cellular interface, provide in-depth analyses of adverse effects on in vivo biological systems, and enable development of theoretical aspects of predictive bio-response models. The research premise will aid in novel nanobiotechnology and nanotoxicology model development and thus enable safe implementation of nanomaterial products. Characterization of Nanomaterials: Systematic evaluation of the role of physico-chemical properties in nano-bio interactions. Key physico-chemical parameters under investigation include: crystal structure, composition, size distribution, morphology and surface properties of primary particles, in addition to dynamic evaluation of agglomerate properties in biological environments. Key agglomerate properties include size distribution, fractal structure, morphology, surface properties, interactions with biomolecules and intracellular agglomeration/de-agglomeration behavior. Novel research topic involves investigation of dynamic aggregation and aggregate structure conformation and their impact on receptor response and biomolecule regulation. Instruments: dynamic light scattering, static light scattering, laser Doppler velocimetry,UV-visible spectroscopy, optical imaging (darkfield and hyperspectral), electron microscopy, energy dispersive X-ray spectroscopy. Cellular Translocation of Nanomaterials: Uptake and translocation of NMs in cells is assessed by electron microscopy. Energy dispersive X-ray spectroscopy is applied to characterize NMs in electron micrographs. Furthermore, mass spectroscopy techniques are used to quantify NM uptake. Instrument: inductively coupled plasma – mass spectrometry (ICP-MS), optical imaging (brightfield, fluorescence, confocal), electron microscopy (scanning and transmission), atomic force microscopy. Ionic dissolution of Nanomaterials: Tangential flow filtration separation of the physical NMs from the generated ions allows for observed bio-responses to be correlated to each fraction, identifying the underlying cause. A highly advanced system that combines tangential flow and ICP-MS for the systematic separation and quantification of particles is in place to facilitate this research aim. Dosimetry of Nanomaterials: The dosimetry is extensively characterized to ensure that the exposure concentration isrelevant and justified with reference to realistic exposure conditions and/or published exposure limits and that exposure concentrations arereported as measured, in addition to all possible calculable or measurable metric, including surface area, mass and number concentration. 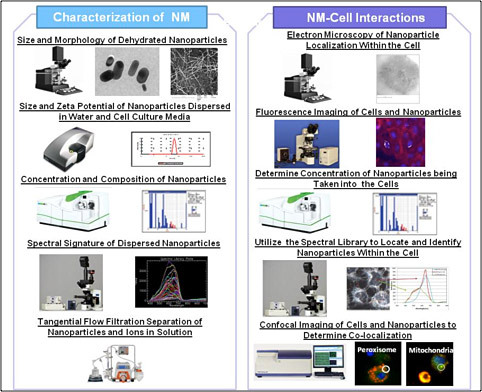 For in vitro studies, the dose of NMs reaching the cell or tissue model of interest is characterized using theoretical and experimental methods. Realistic Exposure Protocols: The exposure approach used for delivering NMs to in vitro models is designed to be relevant to realistic exposure. For example, endothelial cells are exposed to NMs in flowing media and inhalation models are grown at the air-liquid interface and exposed to aerosolized NMs. Real World Evaluation of Nanomaterial Emissions: We assess NM emissions during real world exercises. During each test, we (1) measure airborne sub-micron particulate concentration and size distribution using direct reading instruments, (2) deposit airborne particulates onto substrates for analysis of morphology, size distribution and composition using high resolution microscopy/spectroscopy and (3) capture airborne particulates onto mixed cellulose ester membranes for measurement of composition and mass using mass spectrometry. Blood brain barrier model which employs astrocytes and endothelial cells grown on transwell chambers which have a basal and apical cell layer. Gene Expression Studies: Assessment of in-depth biological responses through target gene analyses and gene expressions in response to emerging NMs and chemicals. Cellular Signaling Modulation via NMs through indirect and direct effects. NMs have been shown to alter signaling pathways in the cell indirectly following exposure. Through evaluating these modifications, it is possible to identify key cellular responses that may be fundamentally altered following NM introduction. Furthermore, NMs functionalized with key bio-moleucles can be used to target specific signaling receptors and mediator proteins to enhance or diminish a signaling response. miRNA Gene Expression:Regulation of Non-coding (miRNA) Gene Expression in Response to Nanomaterial Surface Properties. Are you interested in pursuing an advanced degree in biology, chemistry, or engineering with specific emphasis on nanotechology? Are you a U.S. citizen or do you have a permanent residency? Do you enjoy working both on individual and group projects? Would you be willing to work weekends if experiments demand? Do you have the motivation to publish your findings in high IF journals? If you answered yes to all of the above questions, you have the potential to excel in Dr. Saber Hussain’s research group and should send your CV to saber.hussain@wpafb.af.mil. Please include your name, major, phone number, email address, education including relevant courses taken, GPA, research experience, extracurricular activities, a brief paragraph explaining why you are interested in pursuing research and your interest in nanotechnology, and a list of scientific publications and presentations.